Here are a few links I’ve been wanting to share! ~ This book recently came out: The Comprehensive Guide for the Profession of Equine Assisted Activities and Therapies by Margo Dewkett, Heidi Brady, Heather Hernandez – has anyone read it yet? How is it? If that link doesn’t work, click here (Amazon) or here (Amazon, cheaper). 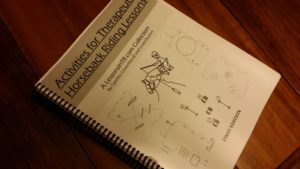 ~ Therapeutic Riding, Inc. has a fantastic newsletter that includes an “Instructor’s Corner” with some good articles in it! ~ Is it Whoa or Woah? You know those words you read your whole life but don’t know how to say? Well I had the opposite, my whole life I’ve said “whoa” but now known how to spell it. When I first started this blog I spelled it “woah” until a reader called me out on it (embarrassing) and I discovered I’ve spelled it wrong in my head my whole life. But now vindication: I’m not the only one. Whaoh! ~ Here’s a nifty trick: ride with one stirrup. ~ Last week on the TED Radio Hour they talked with Wanda Diaz on her experience going blind and learning to Hear The Stars – it’s a great story that pushes the boundaries of living with a disability. ~ Have you seen the trailer for this documentary “Life Animated” Using Disney to Communicate“? It’s based on Ron Suskind’s book, “Life Animated, A Story of Sidekicks, Heroes and Autism,” in which he tells the story of how he and his family discovered that Disney films were a way to communicate with his son Owen, who has autism. Another great story about pushing past our preconceived notions of communication. It’s pretty awesome. And oh yes, check this out! Rough draft #1 ready to get marked up with red! Don’t worry the final cover will be in color 🙂 🙂 🙂 Having a hard copy is so energizing. This is going to happen. Awesome, thank you… and soooo excited to see your Book… will we be able to get it too?? Loving your page and am always incorporating your wonderful ideas into my school. Thank you! I eagerly await its publication. I’ve been hoarding articles from your blog for years, accumulating them thinking, yes, one day I’ll print them out. You’re doing it! Yay..one less job for me! Please let us know how to purchase it when its ready! Hi Heidi, So glad the book would be helpful! I’ll post on the blog when it’s ready and how/where to buy it! You do a great job with this site…it is my favourite resource for TR. Be sure to let us know when your book is ready for purchase…I will be ordering one right away! Brenda thank you so much! For sure I’ll post on the blog first when the book is ready!! Looking forward to the book. Love this website, great ideas, great resource for therapeutic riding instructors. Thank you for the encouragement, Wendy! So glad you’re interested in the book! That looks like a great book. I am an instructor in training, currently at the teaching phase and this book seems like a must buy. When would it be available/where will I get it from? Will you post a link to buy it on here? Hi Emily, I will definitely post on the blog when it becomes available! I will sell it here on the blog first, then look into other venues as well 🙂 I’m so glad you’re interested!